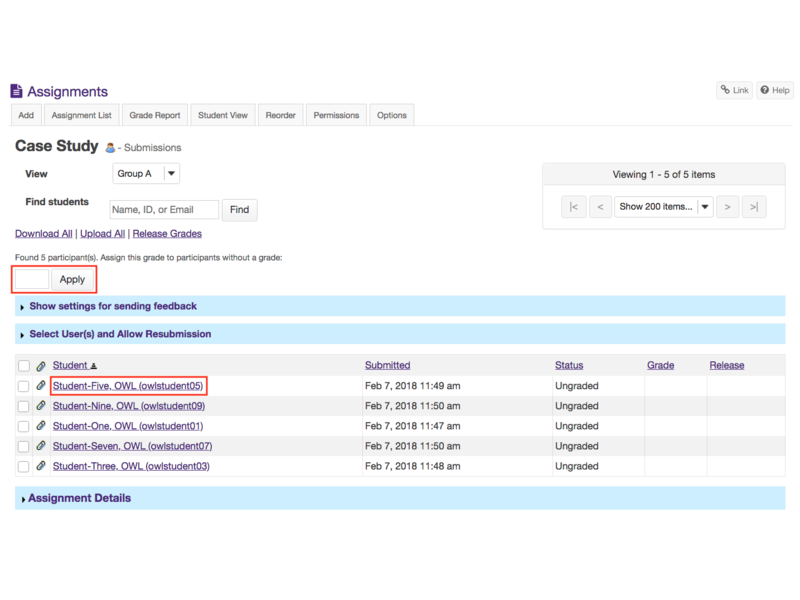 In the ASSIGNMENTS tool, click the Grade link for the assignment you would like to grade. Note: If you have set the Grade Scale to "No Grade", the link will say View Submissions instead of Grade. Click on a student to grade. Apply the same grade for all ungraded students. If you wish to apply the same grade to all ungraded students, enter the grade in the text box above the student list and click the Apply button. Warning: Applying grades using this method cannot be undone. If you have a applied a grade to multiple students and wish to change it, you must adjust each student's grade manually. The student submission will be displayed at the top of the page. Here, you will be able to view the student's submitted inline text and attachments. Note: If the assignment is set to send grades to GRADEBOOK, comments will be sent along with them and will be viewable in GRADEBOOK. Note: You may also click on Previous Returned Attachments to expand that section and view any other attachments that you have returned to a given student for this assignment. 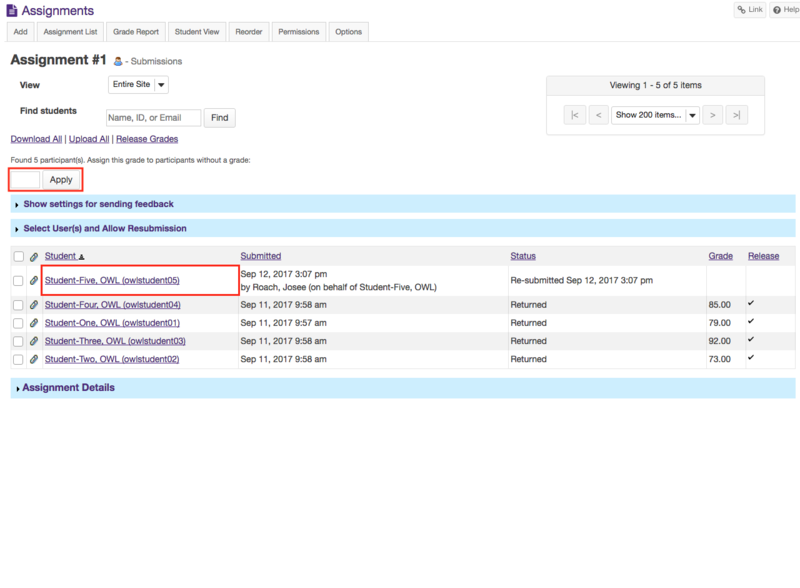 Note: If you allowed resubmissions on the assignment when you created it, the number of resubmissions allowed and the due date will be displayed on the submission page. However, you may override the default resubmission settings for an individual student by changing the information shown here. Alternatively, if you would like to save the grade but wait and release to the student at a later date, you may select the Save and Don't Release to Student button instead. Note: Some instructors prefer to release all of the grades at one time when they have finished entering grades for the whole class. The Navigate Submission buttons appear at both the top and bottom of the page. You may use these buttons to jump to the Preview, Previous Ungraded, Next Ungraded, or Next student submission. 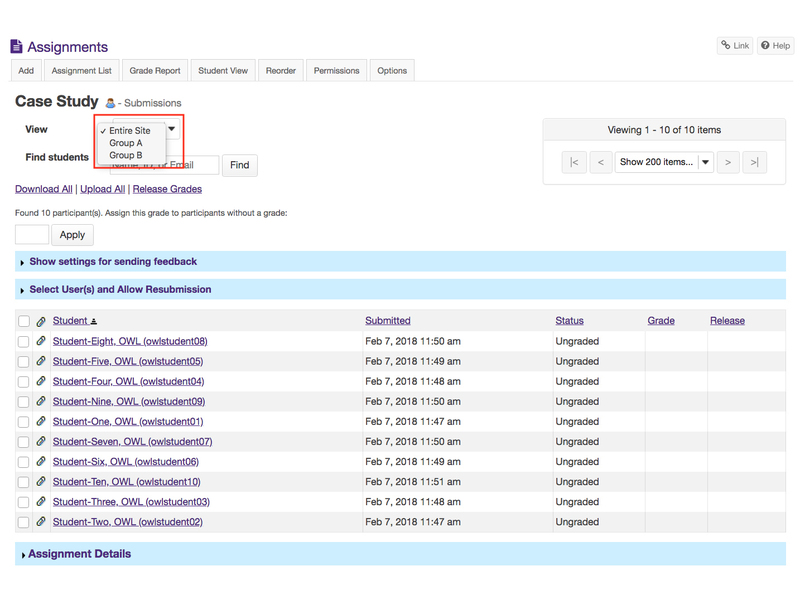 Or, you can select Return to List to return to the full listing of all student submissions. Optionally, you may select the Navigate between students with submissions only check box to skip any students in the list without submissions. 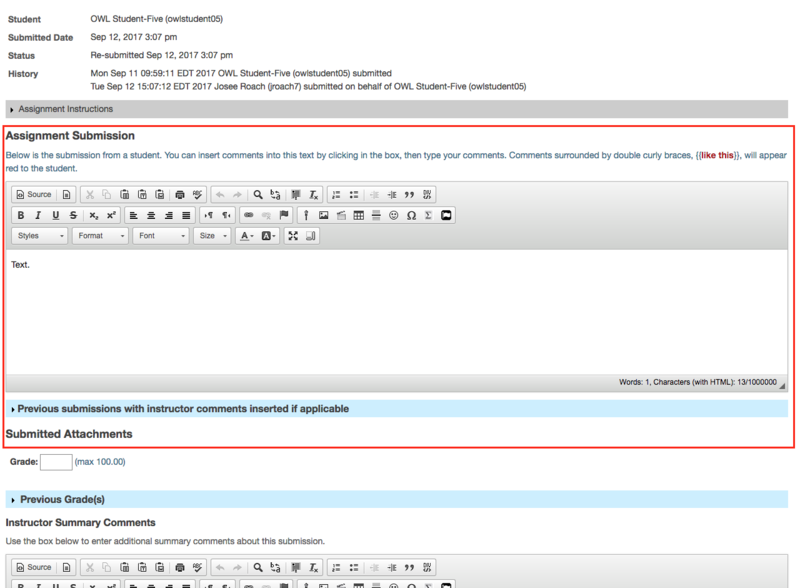 Note: When using the navigation buttons, any changes to grades or comments will automatically be saved. How do I grade an assignment for a section/group? Select the group/section that you would like to grade from the "View" dropdown menu. The list of students will update to show only members of the selected group/section. To grade each student individually, follow the same steps listed under How do I grade an assignment? Alternatively, you can apply the same grade to each ungraded member of the group/section. Enter the grade in the text box above the list of students and click the Apply button.